After 17 races of pain and pleasure, F1 circus moves to the heart of Emirates for Abu Dhabi GP. In the spectacular nightfall venue, the championship has finally been sorted out between a bull and a horse but who emerges as the ultimate champion? we probably will have the answer soon. Alonso and Vettel are striving to capture the coveted triple world titles. Seb though looks set to follow his fellow German Schumacher’s footsteps by becoming the second driver of the millennium to win three successive championships. Alonso came nip and tuck in 2010 only to be beaten by Vettel in that occasion. Fernando managed to limit the damage in the last few races driving a limp-wrested Ferrari. 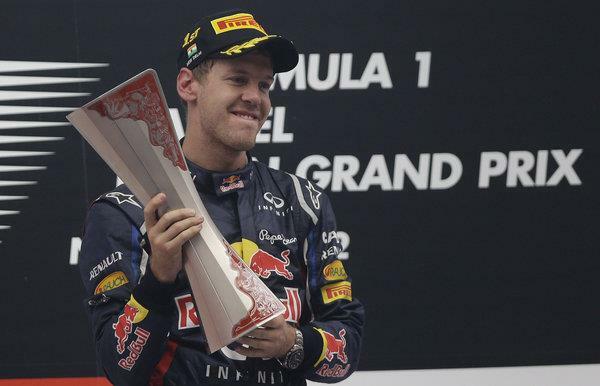 To his woes, Vettel’s Red Bull blasting past every opponent by claiming poles and winning from there unrivaled. Vettel has won four races on the trot and will match Sir Jackie Stewart’s record if he goes one better with 27 victories. The small aperture exists between the two is just 13 points, but it doesn’t tell the entire tale. Alonso led most races topping the table than Vettel but it was in Singapore the momentum started shifting towards the raging bull. Vettel is the only multiple time winner at the Yas Marina circuit, in fact, his first title was won here in 2010 on a truly memorable season. He can’t afford to have a car failure though like last year where he handed the race to Lewis for his third win in 2011. The Mclaren duo has had some good results with both Lewis and Jenson finishing on podium two times. Hamilton has secured pole in the inaugural race as well. Mclaren seemed to be having a steady pace in India which they believe could be carried onto this weekend. If anybody can spoil Vettel’s dominant finger it could probably be the Mclarens only. Alonso’s mission in the evening will be to finish ahead of the young German while Vettel never settle until he tastes the champagne. Raikkonen is downbeat on title hopes but Webber, Hamilton and Button breathing down his neck to seize third in the points table. The good old Mclaren v Ferrari scrap will still be on for the runner-up in constructors’ race. While Red Bull seems untouchable, the F1 giants differ only by a meager ten points. Lotus has more than a hundred points advantage over Mercedes who is being chased by Sauber. Force India experiencing an upturn in form and carrying on the hunt to catch the 23 point deficit to Sauber with Williams and Toro Rosso languishing well behind. Max Chilton makes his Friday practice debut for Marussia in Charles Pic’s car, while Giedo van der Garde is back on duties for Caterham in FP1. Ma Qing Hua also returns to the HRT Friday seat, in for Narain Karthikeyan, while Valtteri Bottas also gets his practice run in place of Bruno Senna at Williams. The forecast stays hot throughout the weekend and strategies will play a big part in winning and losing as the track evolves in all three days. Qualifying is as important as the tyres won’t be examined to their very limits. One-lap pace proves to be the decisive factor so we can expect some storming laps in the final part of qualifying. It’s been a while, please bring the excitement back on! This has been one exciting year. It appears as though the race for the Championship will come down to the last race (unless of course there are mechanical failures or incidents on track or pits). Under the lights makes the race even more exciting! Great to see some test drivers get a chance to drive at night too!